Gymbo's Webkinz Blog » Deluxe Day Today! 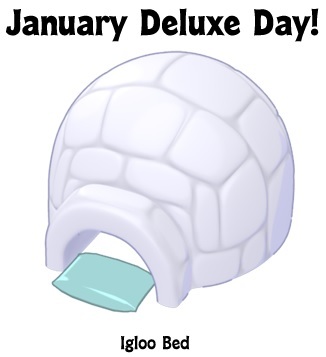 Deluxe Members can log in TODAY, Saturday, January 19th, and visit Today’s Activities in order to receive a special prize: an Igloo Bed! Also on the Today’s Activity schedule, there’s an entire day of fun and activities for Deluxe Members to enjoy! Sorry I didn’t have this up sooner!!! Deluxe Day today & Lunar Eclipse tomorrow! Well, 1-3 inches of snow turned into 6! It’s a winter wonderland! 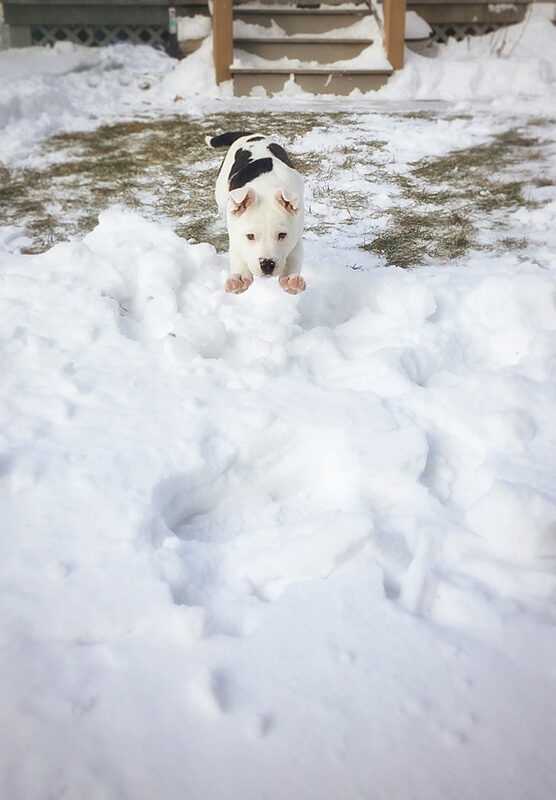 Stella had so much fun bouncing around in all the snow. That’s after she got over being afraid of the shovel! I know this photo looks fake…but it’s totally real! I couldn’t believe I got her mid air like that. gaga—Hope your snow total doesn’t double…it’s left here and headed your way! moms—Thanks for the Deluxe Day reminder! This igloo bed is so cute! And the Lunar Eclipse! It’s supposed to be clear skies tomorrow and very cold…high of 11. Puma—Oh, that sounds just awful. I hope you feel better soon and kiddo doesn’t get it. Miracle/Chant/dee/Puma—Everyone’s recipes sound so good! We are making a Sausage/Bean/Kale soup today. Hope everyone stays safe today! Oh April that pup is so happy. The only thing missing is wings. Lunar Eclipse, full moon … should set the tone for weather for the next 2 weeks. I think it’s supposed to be nicer for us, tomorrow, but today is frigidly cold. I went out to shovel and managed to get our own sidewalk done and nothing more. I came in, removed my mitts and my thumb has split. No matter how much lotion I put on, I get viciously chapped hands during winter and split fingertips are so common that I have a handy dandy bottle of flexible collodian to seal the wounds. I really like this Deluxe day item! I feel like we haven’t had a real igloo in WW yet. There is at least one PSI that looks really weird, and maybe a promo item but it was blue instead of white. I can’t remember if there’s an estore igloo. This one might look a little too fake(?) or just not high-definition enough. The blue pillow door mat is annoying too, but I understand it is a bed. april! congrats on your extra snow! maybe that means a little less for gaga, etc. we have cold yuck gray day with rain, but that puppy just made the day a whole lot brighter! April.. WOW … nice picture !! She is really cute !! Happy to hear that the storm has moved on from your area… Arrived here around 11 am.. has been snowing all day and is expected to continue…Very windy and cold… ? Single digits on Monday..
Dixiecup… winter weather is terrible for hands… Have you heard of Working Hands by O Keefe ?? Works great… use it night and by morning the cracks are so much better… It is a staple here in the winter ! moms… how is your weather down south ?? Wish I could send you some of mine !! gaga – i hope you got to your mom before it all started there! it looks like most of the country is forecast to have some really cold weather for the end of the month – i might need to find that Working Hands too! I’ve used a bath & body works hand cream for years, and it’s good, but i need something better. My hands get so dry, my fingerprint won’t work on my iphone. Ok girls, just finished eating dinner..made the cheeseburger soup. The Guys rated it..a 6 and an 8..so average 7. Said, and I quote. Needs more meat. Kinda rich, but could eat that once every few months. My take is this. Needs more meat, change flour to cornstarch to get rid of flour after taste. Maybe double the onions and celery. Carrots to 1 cup. Definately need all the cheese. And I’d probably add a little more spice wise..still need to play with that..to me it was slightly bland. And I do not like that I can still taste the flour slightly. So yeah, cornstarch to thicken. Maybe even throw in some cheddar cheese too..as to the sour cream. Didn’t change the taste, so I’m confused as to why to use it..I’d probably omit it next time. Ok, for those of you who I have regaled with the security camera footage I watch..ready? We had a murder next door Thursday night. Kid lost his life over a pot deal gone bad..and 200 dollars. So sad. Yes I caught it on camera. I would have seen it live 10 mins. Earlier .no joke. Was up recovering footage all night with police. .I had 6 men in my room with me..was a tight fit. …go ahead dee and moms…little humor there for ya! The police are beyond happy with my cameras.. I have to still go through a in depth interview because we watched most of it live out our bedroom window..but that is set for after the storm. These are the worst neighbors on our street..people are fed up. Want the family out. They are renters. And have really been horrible to have here past two years. But with this last thing..I think land lord is about to be pressured from community. Police are actually behind this. They keep a resting them, they keep getting out. Vicious cycle. One thing really was nasty though. .one of the Sargents needs to learn about halitosis control…oh my..knock a buzzard off a poop wagon! i can not even imagine………. we do wildlife cams……….but thankfully have not caught people…..
moms…was fun to have all the snow. We are supposed to get more later this week! Dixie—Ouch! We have used Bag Balm and that seems to help. gaga—Hope you were able to check on your mom. Will have to try the Working Hands too. Chant—WHAT?! I cannot even imagine either…. So glad you and dh are okay. And no, we don’t know who he is..but it is funny. And they aren’t blocking the sidewalk either.. I see him every on camera doing it. But I’m too lazy to go out and ask why…ok, truth is, if it makes him happy..let him do it..he’s not harming anything, and never comes far enough onto property to set off my alarms..so I let him be. Omg….I just got a text from my ex. Asking…why his um, feces might be a strange color. Seriously!?!? I’m dying laughing over here, sorry girls..it just git me giggling.. I have to go call him and find out particulars unfortunately. .cause he has been I’ll lately, so noticeable changes coukd be an issue..but I’m guessing this will be a dye in food or drinks..lol time to be poop detective! What has my world come to!? And why am I the go to person lately for this kind of stuff!? And I don’t know if you saw or not, but mom’s said you coukd write a list and she woukd put it in the wish lists fir you..
chant – oh holy smokes!!! i can’t believe that happened & you caught it all on video! this is what I made today – it was good! Chant – Sorry you had to witness that. Hopefully the landlord will do something given the circumstances. We got a bunch of snow, not sure how much, but it was more than I expected. I went out briefly around 2pm and nothing had been salted or plowed, not even the freeways! Moms it was actually not bad. Very filling. The guys both said they want it again. If you like cheddar broccoli soup you’ll like this one. Re 31 that sounds really good. I always make my chicken soup from a whole boiled chicken. But I never thought of adding cream cheese! Interesting! I’m doing pot roast later today..lol just realized the time! They are saying we will get ice storm on top of this! So we got generator ready. And plenty of ice melt for driveway. Problem is we live in middle of a hill…so if ice on road, we stay at home. We are luckier then most around here because we do have natural gas for water stove and basement heat. So I just crank that up if we lose power. We have electric heat rest of house..but it’s small enough that the gas keeps it around 55. And we use generator to light the whole house and run the fridge. To those of you getting storms, stay safe! And keep warm..! I’m off to soak in the tub! Calgon, take me away! i think i may be a southerner! Chant, as you can see I have issues with the wishlist and with time. I can write a whole diatribe on chapped hands and other mundane things, but for the life of me I have difficulty asking for anything. By The way, Thank You Zeker for the Dragon Slide! I am having so much fun with it! Those have been bad enough experiences. Well, there was an even worse one down the street, but it hurts too much to discuss. I worry about this next generation, so much. My grown children and grandchildren. What a horrible world it seems they are inheriting. Stay safe, indeed. I pray that this storm fizzes out before it hits. We have had a very mild winter, so far. I wish I could share that with you. Chants… Oh my Gosh !!!!! Can’t image having a murder next door !! much less catching it all on video !! You deserve the Calgon moment… or hours !!!! dee… hope your boys got home safe and sound !! moms.. the chicken noodle soup looks delicious… My favorite.. Just made a bid pot of noodle soup… and beef barley soup.. Freezing stocked up with soup ! How are all the rest of you surviving the winter storm ??? gramma.. you OK ?? Planning to make spaghetti and take it over to my Mom’s for family Sunday ! Have not checked in yet to see how the rest of my family is… ?? cancel.. Looking forward to playoff games today !! Hope you all are safe and warm ! Chant, I gotz no words, just shaking my head. Thankful you folks are ok. I saved your suggested changes for the Cheeseburger soup, because they sound like good improvements, and the same comments my family would probably make. I didn’t end up making it the other night (glad I waited!) Hoping to try it Monday! And thank you, too, for the wish list items from the other day! Always super fun to scratch items off that eternal list. Thanks to the extra Spree dice, I’m finishing up that collection as well. Thanks, Momz, for the tip about the extra cupcake on Webkinz Newz! I would have never found that extra cow room. Chant!!!! Oh my goodness!!! I can’t believe you watched it live. I would’ve been terrified!! One day I will make a recipe one of you post. I like the sound of cheeseburger soup. I think I will go back and try to find that post and try it. I’m with Miracle I am not a great cook either. I would love to have Dee’s skill. Part of my problem with cooking is like in most my life, I’m too blasted lazy lol. Weather here is still pretty warm. Sometimes I think I would like to see snow, but then I think about all the extra work it requires and as I said I’m lazy. I couldn’t imagine digging my car out of snow to go to work lol. I’d call in!!! Stella is beautiful April!!! I just love that picture!!! Everyone have an amazing day and stay safe and warm in the awful weather. I will be thinking of you from Florida! !